The curriculum that makes up the NGA college preparatory diploma program is academically rigorous and prepares students for success in a 4-year university. Advanced math and science courses build and refine the high-level critical thinking skills that are the foundation of the Northgate Academy college prep high school diploma. Rigorous English and social studies and courses that require extensive reading and writing skills, complete the Northgate Academy college preparatory curriculum. College prep students at Northgate Academy are also required to be proficient in a foreign language and earn credits that focus on the fine arts—in order to produce an academically advanced, and well-rounded high school graduate. 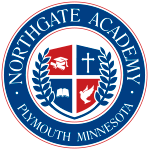 Northgate Academy offers the standard track and college prep high school diploma. *Students planning to attend a 4-year university are required to complete two years of foreign language and must complete Algebra II or higher. University-bound students will also need to take the SAT or ACT national exam. Click here for more information about current course offerings and syllabi.